Our first trip outside Europe was way back in 1985 and brought us into a very different culture: Japan. We have always hesitated to put our information on our site as it might be outdated. But then in 2001, we read Josie Dew’s “A Ride in the Neon Sun: A Gaijin in Japan” and nothing seemed to have changed. So here it is: our travelogue about our Japantrip. All information on these pages is based on our personal experiences cycling in Japan during August and September 1985. Many road signs are in Japanese characters only. A map with names written in Japanese is therefore indispensable. To find your way around your map should at least show road numbers. For your own convenience it helps if it also shows names in Roman script. We used a road atlas of more than 250 pages, including city maps (sorry, no name in English). It showed both road numbers and names in Roman script. To make it more handy we cut loose all the pages and only took the pages we were going to need. Signposting along all the roads is good, but most of the time in Japanese only; all distances are measured in kilometres. We used the well-known Lonely Planet travel guide as guidebook. Nowadays is also specific cycling information available, e.g. 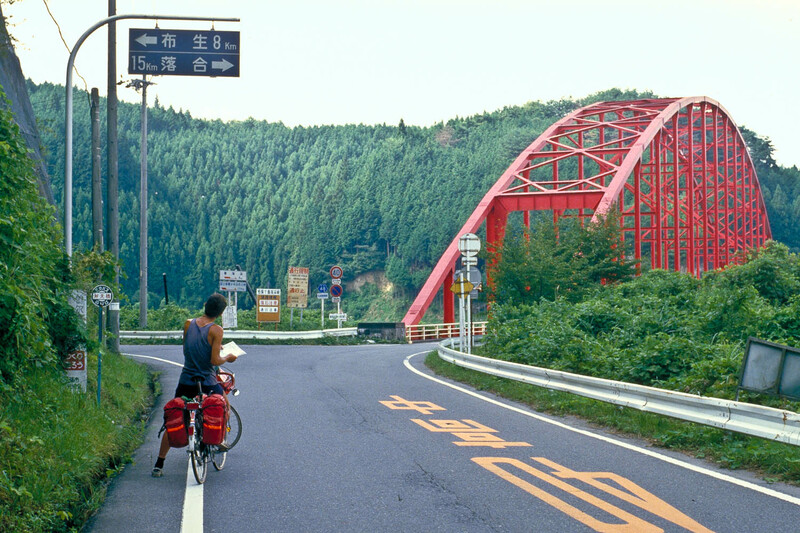 cycling Japan by Brian Harrell. Edited by Japan Adventure Cyclist Club and ‘Nice Voluntary Staffs’. Excellent site.